Just a few more days ‘til it’s 2012! I’m tempted to get those ridiculous New Years glasses where there’s a zero on one eye and a one on the other, just because I like to be all festive and stuff! I’m definitely going to get some noisemakers and sparkling cider. Ooooh and maybe I’ll wear a dress to feel super fancy. Yay for New Years! You know how when it’s New Years Eve, some people make lists of things they want to do or change in the next year? Guess who’s not doing it? THIS GIRL! Yup, that’s right, no resolutions for me. Instead, I got Chloe and Zoey to do something even more fun with me: We’re going to make predictions for each other! 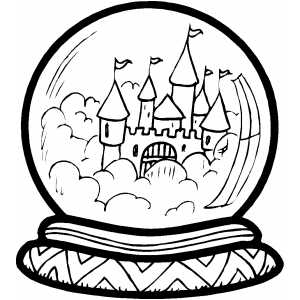 I don’t mean the crystal ball kind. It’s mostly just a postive wish that our hopes and dreams actually come true :-). So I’ll make predictions for Chloe and Zoey, and Zoey will make predictions for me and Chloe, and, well, you get the picture. Each of us has to seal them in an envelope, and then next year we’ll read them all and see if any of the stuff happens. By the end of 2012, Chloe’s going to write her own romance novel! Yup, I think she’ll be a published author with tons of adoring fans who hang on every word. She’ll be interviewed in all kinds of magazines…she may even be on a cover! She’ll end up doing a book tour, traveling ALL over the United States and Europe. And of course she’ll take me and Zoey on a road trip to NYC! We’ll meet some CRAZY rich pop star who looks JUST like me, and I’ll switch places with her for a while like Selena Gomez did in Monte Carlo. They’ll carry Chloe’s book in the school library, so she’ll be a total superstar at Westchester Country Day when she’s done touring. MacKenzie will try to be her BFF because she’ll want Chloe to bankroll her LAME Fab-4 Ever Fashions. But of course Chloe will see right through it because she knows MacKenzie is PURE EVIL! In less exciting news, I think Chloe will also grow her bangs out. She’d look super cute with long flowing hair!! Zoey’s 2012 will be a little less exciting. She won’t achieve any type of international fame (yet!) But she’ll definitely start dating Paul Preston! One day they’ll be working in the library, on opposite sides of the same shelf, and they’ll both go to grab for Chloe’s book. They’ll turn bright red when they realize they BOTH wanted to read it. But they’ll decide to read it together…in the park…with a picnic….while a small man with a mustache plays romantic music on a violin. Then her wish will come true! Yup, Paul will be Zoey’s first kiss! Zoey will also do something super heroic in 2012. Remember that YouTube video with like dozen people who lifted a burning car off a guy who was trapped underneath? Yeah, it will be a lot like that…except Zoey will suddenly get super human strength and lift the car ALL by herself! She’ll be like a 14-year old girl Iron Man, and they’ll get it on tape. It won’t go viral ‘til 2013 though. So I’m thinking this will happen in December, right at the end. Paul will be so proud!! I can’t wait to read what Zoey and Chloe write for me!!! What do YOU predict for me this year?